Joseph Keith. 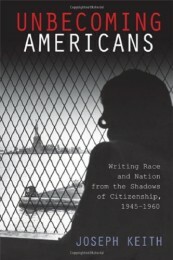 Unbecoming Americans: Writing Race and Nation from the Shadows of Citizenship, 1945-1960. Rutgers University Press, 2013. 239pp. On June 25, 2013, the Supreme Court ruled in Shelby v. Holder that the most important Section (Section 4b) of the 1965 Voting Rights Act (VRA) was unconstitutional. The majority decision, written by John Roberts, was filled with references to progress: “50 years later, things have changed dramatically”; “history did not end in 1965”; “history since 1965 cannot be ignored”; “our Nation has made great strides” (17, 24, 4, 20). Roberts pointed out that blacks vote now more than they did in 1965 and some minorities even hold political office. “Today,” Roberts opined, “the Nation is no longer divided along those lines” (4). The court was ruling on legislation that been modified and reauthorized in 2006. Congress compiled more than 15,000 pages of evidence, held over twenty hearings, and noted that there were more filed instances of discriminatory voting practices between 1982 and 2006 than there were between 1965 and 1982, when the VRA was last reauthorized. The VRA reauthorization passed the House 390-33, the Senate 98-0, and was signed by President Bush. Roberts’ sentiment echoes convenient conclusions from the 2008 presidential election. Jim Hoagland’s comments on election day in The Washington Post typify this rhetoric about a new America: “Even before the votes have been cast, [Obama] has written a glorious coda for the civil rights struggle” (qtd. in Proyect). Of course, these sentiments do not reflect reality. In her Dissent, Ruth Ginsberg details the variety of contemporary “second-generation barriers” designed to maintain white supremacy, argues that equal opportunity to vote is “the most fundamental right in our democratic system,” and asserts that the VRA “became one of the most consequential, efficacious, and amply justified exercises of federal legislative power in our Nation’s history” (39, 34). The “grand aim” of the VRA, according to Ginsberg, “is to secure to all in our polity equal citizenship stature, a voice in our democracy undiluted by race” (66). The court returned federal oversight of state laws to pre-VRA levels, and, Ginsberg observes, “history repeats itself” (67). Race and citizenship are also the subjects of Joseph Keith’s Unbecoming Americans: Writing Race and Nation from the Shadows of Citizenship, 1945-1960. Keith uses work produced between 1945 and 1960 by four nonwhite authors to reveal fallacies in early Cold War narratives about race in America and American citizenship. Keith argues that “the universalism of American citizenship,” an important tenet of American Cold War rhetoric, was a notion “constitutively linked to the production of subjects excluded from national membership” (3). While the Civil Rights movement was organizing a struggle for full citizenship of nonwhite Americans, the logic of Cold War discourse was producing a condition of estrangement that Keith calls “alienage.” “Located at citizenship’s threshold,” alienage “marks the boundaries against which conceptual and political terms of national belonging are…defined and secured”; it “defines the status of individuals and social groups excluded from membership in the social polity”; and it “animates the incoherencies between the nation’s self-imaginings and its economic and political global ambitions” (5, 165, 201). Alienage ultimately provides “an analytic opportunity,” an opportunity and function that becomes the focal point of Unbecoming Americans (136). Unbecoming Americans looks at “minor” works by Carlos Bulosan (America Is in the Heart ), Richard Wright (The Outsider  and his 1950s travel narratives), C. L. R. James (Mariners, Renegades, and Castaways ), and Claudia Jones (her 1953 court testimony, eight-page autobiography, and Notting Hill Caribbean Carnival venture). This study continues the tendency in literary scholarship of arguing for the rehabilitation of neglected texts because of their transgressive qualities. Like Keith’s, which is an insightful and successful example of this tendency, these arguments are usually right. Texts that challenge orthodoxy are often considered failures, and Keith suggests “the ‘failure’ of these works might be reread instead as indicative of subjects and ways of knowing rendered aberrant or illegible by the existing political and literary form in which the state is organized” (17). The authors discussed here “transformed their enforced exclusion from national membership into a prescriptive site” and performed alienage by articulating “a historical and cultural counternarrative of America during the period” that challenged liberal pluralism, the teleological propaganda of racial progress America branded itself with (13, 5). Keith argues that these works were neglected in part because they revealed the lie behind this strain of American exceptionalism. Liberal pluralism was essential to Cold War rhetoric, according to Keith, “not only for framing the terms of domestic national unity but also for underwriting and legitimating U.S. global power” (9-10). All of these writers tied their discussions of race and citizenship to an international context, and these discussions collectively created a “counter-cosmopolitan” perspective. Counter-cosmopolitanism here means an “alternative global consciousness” that can inspire “a radical counterinternationalism…to U.S. state and global power” (158, 77). This perspective could challenge “the nation-state and the entrenched binary logic of the early Cold War” and draft “a model for imagining and articulating an alternative nonnational form of political subjectivity and community (157, 172). By rejecting the rote platitudes of American equality in an international context, these writers provided a counterpoint to liberal pluralism and the rhetorical universalism of American citizenship. Keith finds the key to counter-cosmopolitanism in Satya Mohanty’s theory of the “epistemic privilege of the oppressed.” According to Keith’s appropriation, “some identities…have greater analytic power or epistemic value than others,” and “people who have been oppressed have experiences mediated by these identities…which can provide information and more objective knowledge” about power dynamics in their communities (80). Keith transvalues Mohanty’s theory for his purposes as an “epistemology of unbelonging.” In Wright’s The Outsider, for example, Cross Damon turns his alienage “into an analytic opportunity, an unassimilated and unco-opted angle of vision that could come to serve as an ‘emergent’ model of critical consciousness” (108). The Outsider along with Wright’s travel narratives “can be read as a sustained effort to theorize a model of the black and anticolonial intellectual as the political and epistemological vanguard” because of Wright and his subjects’ outsider perspective (111). James, in his Mariners, Renegades, and Castaways, finds in Ahab’s motley crew “aberrant ways of knowing… that might serve as an articulate and emergent form of resistance to the dominant narratives of the state from which they have been excluded” (157). These alternative perspectives articulate a counter-cosmopolitanism that critically revises hegemonic narratives about race and citizenship. Keith is correct; minority subjects have unique ways of understanding the world, and these alternative perspectives contest discursive orthodoxy and, therefore, state hegemony. But are these counter perspectives otherwise consequential? As Keith points out, “an underlying racist exceptionalism…is not anomalous to but in fact constitutive of the universalist principles of American citizenship” (203). Orthodoxy seeks hegemony in its quest to constitute epistemological certainty, and it metastasizes, spreading out from social discourse into social practice, stabilizing and maintaining state hegemony. Heterodoxy counters with dissent, sustaining the field of opinion by preventing the field of doxa and orthodox narratives from being synonymous, but heterodoxy also simultaneously defines orthodoxy. They are constitutive of each other. The state’s consistent violence against the citizenship of minorities proves the potential efficacy of minorities, but what is the efficacy of their alternative epistemologies to counter state violence? Alienage certainly “represents a disruptive subject position,” but are the consequences of this position more than analytic? The concept of utopia provides a heuristic mode for more explicitly situating Keith’s cultural artifacts in the sphere of consequential political struggle by suggesting that these texts do more than fulfill the discursive requirement of heterodox critique. Recently, for example, Kevin Floyd, Kathi Weeks, and Phillip Wegner have employed the concept of utopia to locate the political promise of narratives in queer subjectivity, feminism, and literature (respectively). And plenty of Keith’s own discussion points to the potential of a utopian emphasis: Bolosan “can be read as striving to fashion an alternative tradition of universalism… against the existing racial limitations of modern imperialism, nationalism, and humanisms” (52); Wright’s The Outsider “is haunted by this communitarian strain – this unfulfilled possibility of some social community” (88); James’s “mariners, renegades, and castaways” of his prison on Ellis Island “in fact form a heterogeneous community more in keeping with a radicalized but genuine cosmopolitan Americanism than that of the American nation-state from which they have been discarded and displaced” (172); and Jones’s 1959 Caribbean Carnival created (in Bakhtin’s words) “’a utopian realm of community, freedom, equality, and abundance’ that unmoors, albeit temporarily, fixed social roles and facilitates a free and familiar dialogue between people” (194). Keith concludes that “these figures left behind a rich legacy of universalist visions of social justice and aesthetic practice that can help remind us of more radical thresholds of democracy,” which signals the potential for a productive extension of his ideas. Unbecoming Americans provides a sophisticated synthesis of disparate texts, highlights the significance of discursive critique during the early years of the Cold War, and encourages scholars to investigate other neglected works in search of both alternative perspectives of social discourse and alternative conceptions of the social itself. American society between World War II and the Voting Rights Act was a particularly explicit battleground for the civil rights of American citizens. Today, massive resistance to civil rights continues with new strategies, ironically confirming Clarence Thomas’s statement in his concurring opinion, which he intended to prove the absence of ballot barriers: “circumstances in the covered jurisdictions can no longer be characterized as ‘exceptional’ or ‘unique’” (30). Indeed, eighteen states have passed voter suppression bills since 2011, including all of the states covered under Section 4 of the VRA (ACLU). Two years before the VRA was passed and fifty years before Shelby v. Holder, Martin Luther King, Jr., articulated a utopian vision in a speech at the end of the March on Washington that inspired millions of white Americans to reevaluate the logic of white supremacy. While Roberts and Thomas are rightly chastised for straining constitutional law and precedent to disenfranchise minorities, critiques of their maintenance of orthodoxy pale in comparison to the potential of utopian visions that inspire more than rhetorical struggles. ACLU. “The Battle to Protect the Ballot: Voter Suppression Measures Passed Since 2011.” Aclu.org. American Civil Liberties Union, n.d. Web. 1 Oct. 2013. Keith, Joseph. Unbecoming Americans: Writing Race and Nation from the Shadows of Citizenship, 1945-1960. New Brunswick, New Jersey: Rutgers U P, 2013. Print. Proyect, Louis. “Obama’s Doublespeak on Race.” Louis Proyect: The Unrepentant Marxist. 28 July 2013. Web. 28 July 2013. Shelby County, Alabama v. Holder, Attorney General, et al. 570 US. Supreme Court of the US. 2013. Supremecourt.gov. Supreme Court of the US, n.d. Web. 1 Aug. 2013. Michael Mayne is an adjunct instructor at Denison University. His research interests include 20th-century American history and culture.